Yesterday I walked to and from the office with temperatures in the 20s and a sharp, cutting wind reddening my face and sending my suddenly flimsy raincoat flapping around my legs. This morning I woke up and, as I stood in our warm kitchen sipping a blessedly hot cup of coffee, I heard rain on the roof. 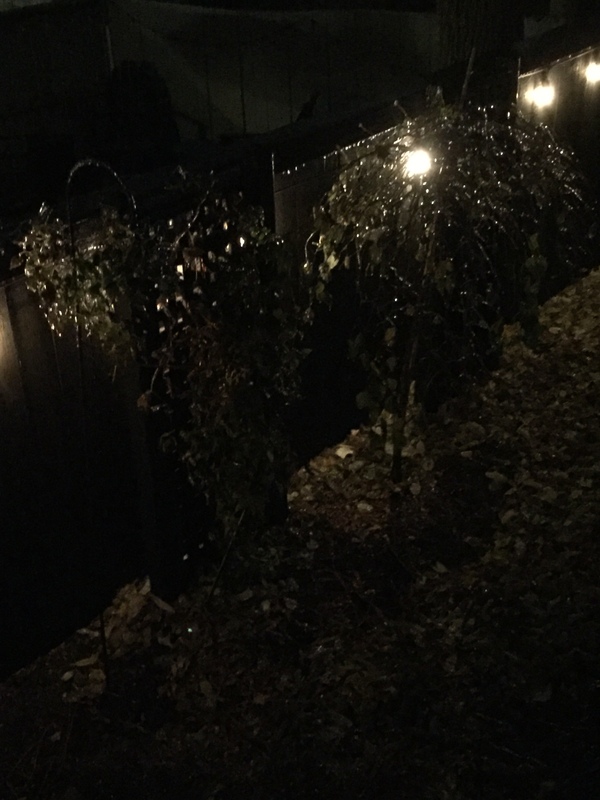 I looked out into the backyard in the pre-dawn darkness and saw the glittering evidence of the Queen Mother of Crappy Weather on every plant, tree, shrub, and fencepost. Yes, that’s right — a dreaded onslaught of freezing rain has coated every object in ice. Freezing rain, for those lucky people who’ve never experienced it, means that it’s not quite cold enough for precipitation to fall as snow, but just cold enough for the rain to turn to ice once it hits the ground. It’s the worst winter weather of all because it’s cold, and wet, and frozen all at once, and it means the commute this morning will be slick and treacherous for drivers and pedestrians alike. There’s a breeze, too, and the weather page helpfully reports that it feels like 22 degrees out there. It’s the kind of weather that makes February in Columbus inarguably the worst weather month of the year. But, it’s only November 15. Hey, Mother Nature! What gives? We’ve once again experienced an abrupt mash-up of the seasons here in the Midwest. True fall weather has been fleeting, and it seems like we’ve moved directly and too quickly into winter. For those people, like me, who think autumn is the best season of the year — well, we feel cheated. We know Old Man Winter is going to arrive sooner or later, but can’t he at least wait until after we’ve had our Thanksgiving dinner before he hits us with freezing rain and another round of “wintry mix”? If you’re in the Midwest, brace yourself, because it’s too cold too soon . . . again.